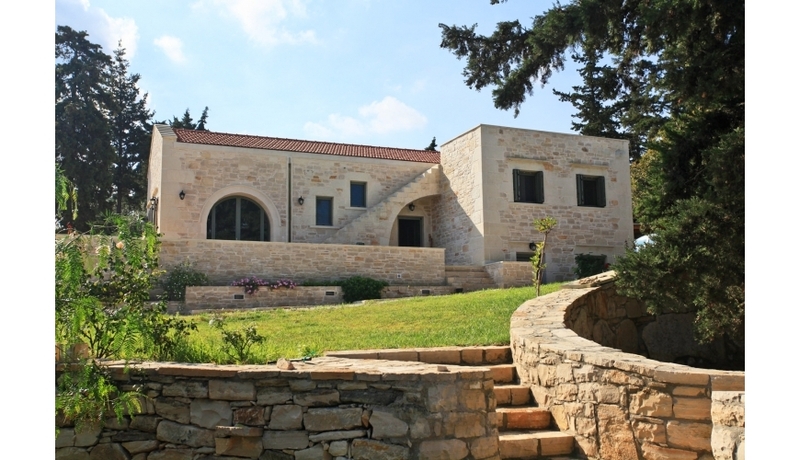 This is an extremely well maintained ‘Main Villa’ and separate ‘Guest Villa’ with a combined living space of 220M2 . The two villas are at on a large, beautifully landscaped plot with a private pool and sun terraces, orchards and vineyard. There is an outdoor Kitchen and BBQ along with many attractive garden areas. All with Panoramic Sea and Mountain views. These 2 lovely villas were built by the current owners with care and attention to detail. They are perfect as either a full time home with masses of guest space or as a desirable holiday rental business generating a good income. Both villas sit on a large private plot and share many attractive external areas as well as having private terraces, balconies and pathways for each villa. The gardens include a wide variety of seating areas in both sun and shade and include fruit orchards, a vineyard, vegetable gardens, an ornamental Greek rock garden and a securely fenced area ideal for a children's play area. There is an external covered dining area along with more storage areas and a wood shed. There is also a very attractive outdoor kitchen area with pretty stone archways and plenty of dining space. This incorporates a built in BBQ, wood oven, sink and worktops and plenty of cupboard space. The very spacious raised pool area offers plenty of privacy and stunning views across Souda Bay. The pool has a Jacuzzi pump feature - along with plenty of surrounding terraced area for soaking up the sun— and there is also a covered pergola for shade. An additional, separate access room at the rear of the property is currently used as office space but could be an additional bedroom. Underneath the main house there are additional storage areas plus a boiler room and storage tanks. This very spacious home has a vast, open plan split level living and dining area with a feature fireplace and wood burner. Double patio doors lead to the spacious upper balcony — with a canopy — which overlooks Souda Bay. Also on this level is the modern, luxury, fully fitted kitchen installed in 2012 with built in appliances and breakfast bar/island. Wooden stairs leads to the lower floor which has 2 double bedrooms. The spacious master bedroom has large fitted wardrobes, additional linen cupboards and an en-suite bathroom with a full bath and vanity unit. This room has its own side terrace and a shared front terrace with the 2nd double guest bedroom. Also on this floor is a further bathroom with a glass shower enclosure and a 2 room utility and laundry area with a door leading out to the gardens. The totally separate guest villa has a large open plan living, dining and kitchen area on the upper floor. Double patio doors lead from here to the sizeable front terrace with lovely sea views. The lower floor has a generously sized double sleeping area plus an additional kitchenette, washing machine and shower room. To the side of the villa is a lovely shaded courtyard with an outdoor BBQ. This lovely villa is perfect for either guests and family or it can be rented separately from the main villa. A wide variety of citrus, fruit and olive trees. What's the result of multiplying 2 by one?